This is telephoto view looking northeast across the north side of the base. At the lower left is the Hill Housing area, showing only the homes built in the late 1970s along eastern Anderson Ave (now J.P. Rizal Ave). 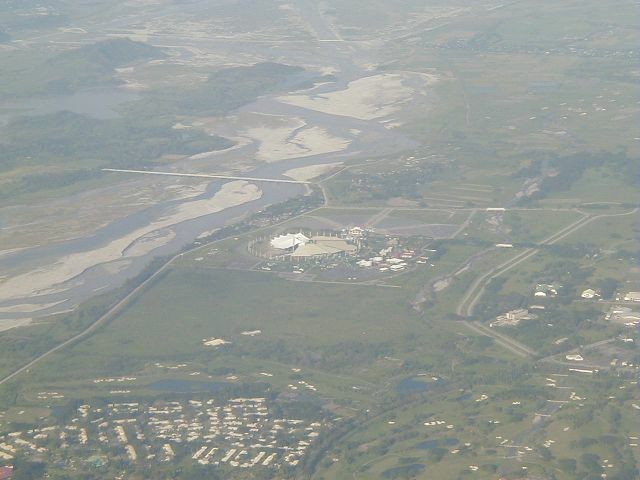 At the center is the "Elephant Cage", a circular array of military radio antennas that has now been converted into an museum/amusement park called Expo Pilipino. 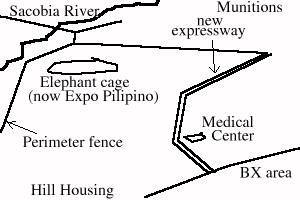 There is an divided expressway on the right side, R. Magsaysay Ave, that was not part of Clark Air Base. Want to correct or clarify information about this photo? Send an E-mail to clarkairbase@clarkab.org. Mention you are referring to page "a17.htm".